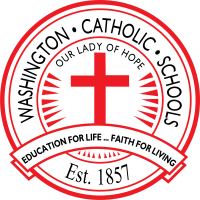 Washington Catholic High School Code: 153695 It is important that this number be included on the test registration form for both the SAT and ACT test so that we receive scores to be put onto the student’s transcript. Many colleges and universities want the score reported directly to them from the testing headquarters SAT (College Board) and ACT. The school codes for the colleges and universities that are to receive the score can be found on the registration web site. Up to four schools (not counting Washington Catholic) can be named to receive the scores at no charge. However, there is a charge AFTER the test to send scores. Fee is $50.50 without Writing/$64.50 with writing. However, check if your school(s) of choice requires a writing score. PSAT Test date for Freshmen, Sophomores and Juniors: Wednesday, October 24th will be the test date for the Sophomores & Juniors . The Indiana Department of Education will pay the $16 fee for Sophomores to take the test. There will be a $16.00 charge for Freshmen and Juniors. In 2017-2018 the Freshmen took the PSAT in the Spring. To be considered for the National Merit Scholarship Juniors MUST take the test in the fall of their Junior year. Having taken the test as a Sophomore will NOT make them eligible.